Our third Foreign Correspondent has returned from her travels! Mary, her husband, and her two children traveled to Central America this winter. We outfitted them with a suitcase full of Tea before they left, asking them to share their adventures with us upon their return. Below is part three of their adventure. To learn more about her family’s adventures, check out her The World is a Book blog. 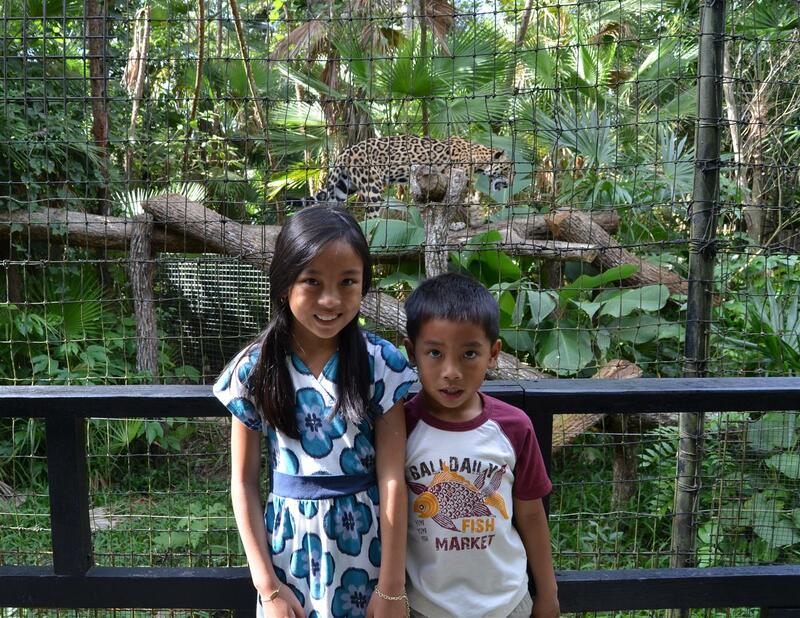 During our excursion, we visited the country’s only zoo despite our limited time in Belize. The Belize Zoo was established in 1983 as a haven for animals used in a forest documentary. In time, it became a refuge for animals that have been orphaned, rescued, or donated from private owners. This is unlike any zoo we’ve ever visited. It currently houses over 150 different animals all native to Belize. Animals lived in thick landscapes much like their natural habitat instead of concrete cages. The enclosure fences were shorter. We were able to see most of the animals up close. On some exhibits, we could have reached in and touched them. Of course we were tempted, but didn’t. The zoo was so large, we had to come back a second day to see the rest of the animals. There were no giraffes or elephants here – much to my kids’ disappointment at first. Instead, we were instead treated to animals we have never heard of or seen before. Ever heard of a tapir (Belize’s national animal that looks like an anteater), a Jabiru stork, a quash (racoon relative) or a motmot (bird)? We also had the opportunity to visit a monkey exhibit in Roatan, Honduras during this trip. I was particularly nervous of letting my kids step inside but was assured the monkeys were safe. Once inside, the monkeys instantly clamored to find the nearest arm or shoulder to climb on. These animal encounters were one of the trip highlights for our kids. They were introduced to new animals and learned about the importance of their native habitat. These were memorable experiences that certainly fostered their love and appreciation for animals. Visit our Studio T blog tomorrow to learn about the family’s experience in Mexican markets. Thanks for the tip Katy. I will definitely look for the book. The Belize zoo was such a unique and special place. Oh wow! I loved the belize Zoo! I am pretty jealous of your visit with the monkeys, wish I got to do that. You should read the book, The Last Flight of the Scarlet Macaw, its about the women who started the Belize zoo. She an amazing person.